Snowboarders are vulnerable to gravity. Image: Picswiss.ch. How do you test the effects of gravity? One way is to tip yourself over the edge of your snowboard as you are elegantly gliding along to see how long it takes until you hit the ground. We tried that last week, but it didn't work (the Plus scientist contracted concussion). Another is to win a £4.2 million grant to develop sensitive equipment to detect elusive gravitational waves. This is what the University of Glasgow has just done, having applied for the funding from the Science & Technology Funding Council. where and are the two bodies’ respective masses, is the distance between them and is the gravitational constant, approximately equal to . From this you can work out how long it should take a falling snowboarder to meet the snow face-on. The Glasgow experiment, however, will test a more sophisticated theory. Newton came up with his law in 1687 and it remained unchallenged until 1905, when Einstein published his special theory of relativity. The theory says that there is a universal speed limit in the Universe: nothing can travel faster than light, that is, nothing can travel faster than roughly 300,000 metres per second. According to Newton, however, the effect of gravity is instantaneous. Take away the Sun, and the effect will be felt on Earth immediately. Einstein himself later remedied this problem by proposing that gravity isn't a force that wafts across the ether in some mysterious way, but a result of the curvature of space. An analogy that is often given is that of a bowling ball sitting on a trampoline. The ball creates a dip in the trampoline, curving its surface, so a marble placed nearby will roll into the dip towards the ball. According to Einstein, massive bodies warp space in a similar way, causing less massive bodies to be attracted to them. One of the consequences of Einstein's theory of gravity is that when gravitational monsters such as black holes shunt their weight around, they should create ripples that can be felt across space and time. "Near black holes the curvature of spacetime is extremely high," explains Bangalore Sathyaprakash, a gravity expert. "Now imagine two black holes moving around each other: the curvature is large but also changing. It's a bit like taking a stick and moving it around in a pond. That's going to generate ripples in the water. Only in the case of black holes, we're talking about ripples in the very fabric of spacetime." These ripples are the gravitational waves researchers at the University of Glasgow will be looking for. They will develop instrumentation for gravitational wave detectors with a sensitivity of around 1/1000th of the diameter of a proton (10-18m). Sheila Rowan, Professor of Physics and Astronomy at the University of Glasgow, said: "We are entering a very exciting time in the search for gravitational waves. Experiments aimed at detecting gravitational waves have been in development for several decades and we are now reaching sensitivity levels where detection is expected in the next few years." We hope they won't come away with concussion! You can find out more about gravitational waves and gravity in general in Catching waves with Kip Thorne and How does gravity work? We've read the book. We've bought the T-shirt. And now, finally, here it is: the movie of one of our favourite maths problems, the bridges of Königsberg. Though admittedly, we made it ourselves. We learnt several interesting lessons in the process. For example that a bin doesn't make a good supporting character and that people who shouldn't be in the frame should get out of it. But other than that, we're well on course for an Oscar this weekend! This video was inspired by content on our sister site Wild Maths, which encourages students to explore maths beyond the classroom and designed to nurture mathematical creativity. The site is aimed at 7 to 16 year-olds, but open to all. It provides games, investigations, stories and spaces to explore, where discoveries are to be made. Some have starting points, some a big question and others offer you a free space to investigate. There was a brief pause in research at the Department of Applied Mathematics and Theoretical Physics at the University of Cambridge (DAMTP, also the home of Plus) this afternoon to celebrate the newly established Chair in Cosmology. The Chair, funded by a $US 6 million donation from Avery-Tsui Foundation, is named after Stephen Hawking and he will be the first to hold the Professorship. Paul Shellard, Director of the Centre for Theoretical Cosmology, said that the honour recognised Hawking's contributions to changing our understanding of the Universe. "When I arrived at DAMTP in 1962 cosmology was a speculative science and we didn't know if the Universe had a beginning or had existed forever in a steady state," Hawking said. He went on to say that the new Professorship recognised the role of the department in taking cosmology from this speculative start to the remarkably successful field it is today. We'd like to congratulate Hawking on his new post (and thank him for the cake and champagne!) and look forward to the next exciting discovery from our cosmologist neighbours. You can read more about Hawking's life and work in his articles 60 years in a nutshell and A brief history of mine, and in our coverage of his 60th and 70th birthday symposia. And of course, there's much more about cosmology on Plus. As we saw here, the rational numbers (those that can be written as fractions) can be lined up one by one and labelled 1, 2, 3, 4, etc. They form what mathematicians call a countable infinity. The same isn't true of the irrational numbers (those that cannot be written as fractions): they form an uncountably infinite set. In 1873 the mathematician Georg Cantor came up with a beautiful and elegant proof of this fact. First notice that when we put the rational numbers and the irrational numbers together we get all the real numbers: each number on the line is either rational or irrational. If the irrational numbers were countable, just as the rationals are, then the real numbers would be countable too — it's not too hard to convince yourself of that. and so on, with every real number occurring somewhere in the infinite list. Now take the first digit after the decimal point of the first number, the second digit after the decimal point of the second number, the third digit after the decimal point of the third number, and so on, to get a new number . Now change each digit of this new number, for example by adding . This gives the new number . This new number is not the same as the first number on the list, because their first decimal digits are different. Neither is it the same as the second number on the list, because their second decimal digits are different. Carrying on like this shows that the new number is different from every single number on the list, and so it cannot appear anywhere in the list. But we started with the assumption that every real number was on the list! The only way to avoid this contradiction is to admit that the assumption that the real numbers are countable is false. And this then also implies that the irrational numbers are uncountable. It's easy to see that an uncountable infinity is "bigger" than a countable one. An uncountable infinity can form a continuum, such as the number line, in a way that a countable infinity can't. Cantor went on to define all sorts of other infinities too, one bigger than the other, with the countable infinity at the bottom of the hierarchy. When he first published these ideas, Cantor faced strong opposition from some of his colleagues. One of them, Henri Poincaré, described Cantor's ideas as a "grave disease" and another, Leopold Kronecker, went so far as to denounce Cantor as a "scientific charlatan" and "corrupter of youth". Cantor suffered severe mental health problems which may have resulted in part from the rejection his work had met with. But we now know that his work had simply come too soon: 150 years on, Cantor's ideas form a central pillar of mathematics and many of his results can be found in standard textbooks. See our infinity page to find out more about this and other things to do with infinity. A mathematical computer model of glaciers has shed new light on the disappearance of four young Alpine walkers, nearly ninety years after they met their deaths in 1926. Water is essential for life on Earth, and it is a resource we all take for granted. Yet it has many surprising properties that have baffled scientists for centuries. Seemingly simple ideas such as how water freezes are not understood because of water's unique properties. Now scientists are utilising increased computer power and novel algorithms to accurately simulate the properties of water on the nanoscale, allowing complex structures of hundreds or thousands of molecules to be seen and understood. The Arctic ice cap is melting fast and the consequences are grim. Mathematical modelling is key to predicting how much longer the ice will be around and assessing the impact of an ice free Arctic on the rest of the planet. Plus spoke to Peter Wadhams from the Polar Ocean Physics Group at the University of Cambridge to get a glimpse of the group's work. On the 1st of March 2009 three intrepid polar explorers, Pen Hadow, Ann Daniels and Martin Hartley, set out on foot on a gruelling trip across the Arctic ice cap to conduct the Catlin Arctic Survey. In this teacher package we look at some of the maths and science behind their expedition — climate and sea ice models, GPS and cartography, and how to present statistical evidence. You can also read more about the expedition in the news stories On thin ice and Further evidence for Arctic meltdown. Jim McElwaine tells Plus how he combines his two loves - mathematics and mountaineering - in avalanche research. And if you want to learn more about maths and sport in general, visit our sporty sister site. Climate change threatens the world's glaciers, which is why scientists simulate them on computers. Based on mathematical models, these computer simulations help predict how glaciers are likely to change in the future, depending on environmental factors. The Aletsch glacier in Switzerland. But you can also run these simulations backwards in time, to see how a glacier behaved in the past. This is what a mathematician and a glaciologist have just done, not in order to understand glaciers, but in order to solve a mystery. In March 1926 four young men, three of whom were brothers, set off on a tour from the Aletsch glacier in Switzerland, the longest glacier in the Alps. They never returned. It's likely they got caught up in a blizzard that raged in the mountains for several days. Despite an extensive search their bodies could not be found and nobody knew where on their trip they met their end. Eighty-six years later, in the summer of 2012, two English alpinists found the remains of the three brothers and some of their equipment. The mathematician Guillaume Jouvet of Freie Universität Berlin and the glaciologist Martin Funk of the ETH in Zürich realised that they could use a computer model of glaciers, which Jouvet had developed during his PhD in 2012, to find out where the men had met their death. The model was the first to represent the three-dimensional flow of a glacier, including the velocity of the flow beneath its surface. Starting from the place the men's bones were found, the scientists simulated the evolution of the glacier backwards in time. They found that the bodies probably moved by around 10.5km in the 86 years since they had been swallowed by the ice, at an average speed of 122 meters per year. In 1980 they were buried some 250m below the surface of the ice. And the place of the men's demise could be narrowed down to an area of 1600m by 300m. Jouvet and Funk hope that they can solve other glacial mysteries using their method. 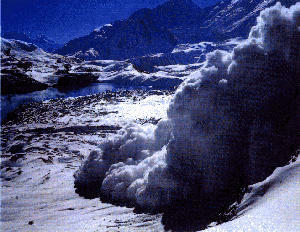 For example, in 1964 a plane carrying US military crashed on the Gauli glacier in Switzerland. Crew and passengers could be rescued, but the plane disappeared in the ice without a trace. Using their model, Juvet and Funk hope to predict when and where it will be released from the ice. And who knows what other icy stories their model will reveal in the future. Jouvet and Funk's work on the young men who died in 1926 has been published in the Journal of Glaciology. Thanks to our friend Thomas Vogt of the German Mathematical Association for bringing this story to our attention. You can read more about maths, ice and snow here on Plus.